When flooding occurs in your home, the results can be disastrous and the damage to your home significant. Structural elements, walls, floors, personal belongings, and furnishings can all sustain damage. The cause of a flood can be anything – burst frozen pipes, poor drainage, excess rains, overflowing appliances, sewer system backups, even water from putting out a fire – but, whatever the reason for the flood, you should seek immediate help from a professional flood damage restoration company. 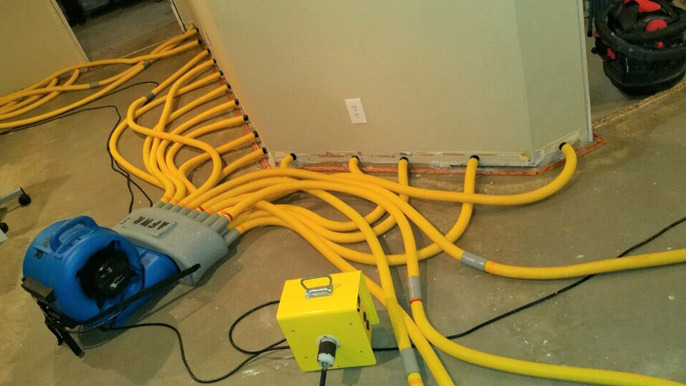 Only a professional water damage cleanup company that specializes in flood damage restoration has the expertise to properly treat all types of flood water in your home and perform the appropriate drying and cleanup that restores your property to pre-flood-damage condition. American Fire & Water Restoration, a full-service water and fire damage restoration company, provides expert flood damage restoration services. We understand the considerable impact flood damage can have on you and your home, and have the expertise to handle any flood problem. With more than 25 years of experience behind us, we provide top quality work and superior customer service every day of the year. We are available to take your emergency call 24/7, and our technicians arrive on site promptly to begin the cleaning and restoration process based on whatever type of damage the flooding caused. Perform an initial assessment of the area to identify the source of water entry and the steps needed to prevent further water entry, and to determine an appropriate course of action. 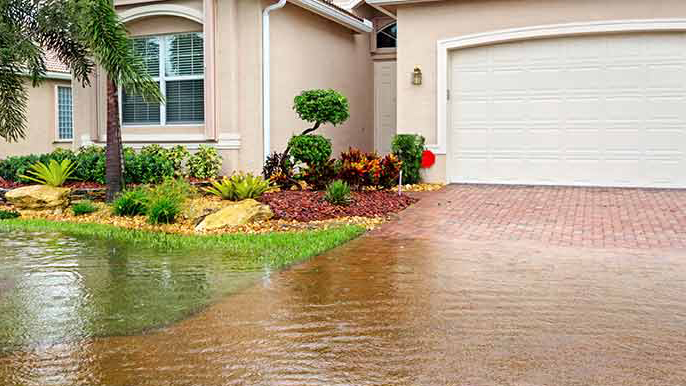 Categorize the type of flood water on your property by identifying the source of the water and the types and levels of contaminants that may be present. Fully assess the flood damage to determine how much flooding occurred and the level of dampnessin floors, subfloors, and carpeting; amount of water absorption or stains on walls; and amount of water/dampness on porous surfaces such as concrete or brick. Extract the floodwater with truck-mounted equipment and submersible pumps to remove water directly to our truck. Inspect the property to look for signs of water damage to personal belongings and structural components; salvage items to be cleaned and restored; properly dispose of items that cannot be restored or renovated. Dry the entire affected area with specialized equipment such as dehumidifiers and heat dryers; ensure moisture and humidity levels meet standards by monitoring and measuring the amount of moisture saturation in the air. Clean and disinfect the affected area using safe, approved products and practices, and take steps to ensure mold cannot grow and thrive in dark, hidden areas. Our goal is always to restore your property to its pre-flood-damage condition, and to do so safely, effectively, and efficiently, and with minimal disruption to you and your family. If your home has experienced flooding, don’t wait another minute and don’t attempt to remove the water yourself. A delay in getting professional help can only make matters worse, as water will continue to seep into the structure and furnishings, and may end up not getting thoroughly removed or properly dried and sanitized. When you call American Fire & Water Restoration, you know you will be getting the experience and expertise from professionals who know how to remove flood water and fix the damage the right way. Because a flood usually strikes without warning, it is easy to feel overwhelmed when this type of disaster occurs. Whether the flooding is contained in one corner of your basement or the water is inches deep in your living room, most people don’t know where or how to begin the difficult task of removing floodwater and cleaning up the mess. At American Fire & Water, we are experts at handling these types of disaster, and we keep your needs at the forefront at all times as we work to help you get your life back to normal. American Fire & Water Restoration disaster cleanup and restoration services are available in Lake, McHenry, and north Cook Counties in Illinois, and southern Kenosha County in Wisconsin. We are available 24/7/365 to take your emergency call, and our technicians arrive onsite promptly in marked company trucks, ready to handle any type of flood or other property damage you may have sustained. Regardless of the type or amount of flooding you’ve experienced call us right away. We’ll be onsite quickly and get to work right away to provide the expert water extraction and cleanup services you need.